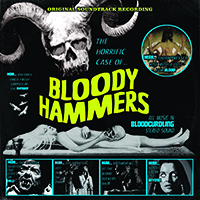 Back with a brand new EP, BLOODY HAMMERS have released “The Horrific Case of Bloody Hammers”, with the Transylvanian group remaining with Napalm Records. The trio only released “Lovely Sort of Death” last year, and this new record is their fifth studio release. BLOODY HAMMERS is an American hard rock band, founded in 2012 by Anders Manga in Transylvania County, North Carolina. Manga is the primary producer, singer, songwriter, and instrumentalist. The band’s music straddles a wide range of genres including gothic rock, doom metal and psychedelic rock. The new EP features just six tracks, which for any new listeners is quite enough to give you a taste of the band and their style. Opening with “Gates Of Hell” you have a powerful riff that reminds one of TESTAMENT, something to be expected from a trash metal band. The entire album has a horror sound to it, emphasized by Manga’s vocal delivery, and a devilish atmosphere. With “Blood” there is a huge emphasis on the organs, Devallia does a great job at transporting the listener to a dark classic horror movie. The doom elements make the song a bit mellow, for some reason this song makes me think of STATIC X in terms of vocals. “Vultures Circle Overland” is complex, the guitar sound is crushing, painfully articulated vocals and an incredible torturing rhythm. This song might be my personal favorite because it’s maturity; you have a fast paced harmony, abruptly interrupted by a horror tone. “The Bloodsucker Leads The Dance” it’s a gothic delight, where Mange leads another powerful vocal performance. Overall, “The Horrific Case Of Bloody Hammers” is a good EP, I actually enjoyed it more than I would have expected. It has a multitude of notes to it that can satisfy a lot of music enthusiasts, my only complain would be that it might seem a bit dull when listening to it more than a couple of times. If you want my 2 cents on this, go give it a try; you might like what you are hearing.